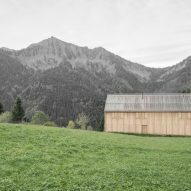 This timber-clad residence by Bernardo Bader Architects appears to be raised on stilts above chunky concrete foundations in the mountainous Vorarlberg region of Austria. Haus am Stürcherwald sits at 1,000 metres above sea-level in the village of Laterns, and was designed to resemble the Walser farmhouses that populate the area. Many of these traditional multi-storey and often wooden houses feature pitched roofs with covered balconies. Bader's design is a contemporary take on this style, featuring sawn-larch slats and a gabled roof. The architect and his studio wanted to reduce the impact on the surrounding landscape, which it achieved through the simple rectangular-shaped body of the house. The side-view of the building is deceptive in that it masks the true scale of the building by appearing to perch on stilts on the sloping terrain. The plot of land had been considered useless due to its location on a hillside lying between two sections of the curving mountain road. 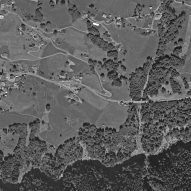 However, with the addition of a concrete foundation block to even out the surface area, the architects were able to make the most of the rural vistas. The elongated rectilinear form of the house allows for nine large windows on the ground level that face into the surrounding forests. The main body of the building rests on the concrete block, with its edges overhanging. Vertical timber beams run along the facade, mimicking the balconies of traditional Walser houses, and giving the appearance of supporting stilts. 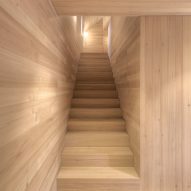 The studio said its subtle interventions are proof of the effective "reactivation of traditional building types without using the cliches of classical forest houses." 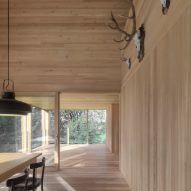 The interior of the house is lined entirely in the same larch panels as the exterior, although the architects opted instead for planed rather than sanded surfaces here. Living areas are spread over the top two floors of the house, while a partial basement located within the concrete plinth offers utility spaces. The ground-level entrance unfolds into a double-height and open-planned kitchen-living area. Lined with windows, the space is open the whole way to the roof. Galleries running along one side of the upper floor overlook the living area. The windows wrap around the ends of the building, allowing natural light to flood the living area, with the aim of making the most of the sunlight as it moves across the house throughout the day. There are two bedrooms with loam-covered walls on the top floor, alongside ensuite bathrooms. 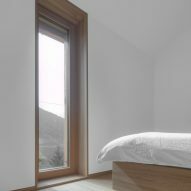 Shutters can be used to conceal the windows on the upper level, creating a uniform larch-slatted facade at back of the house. 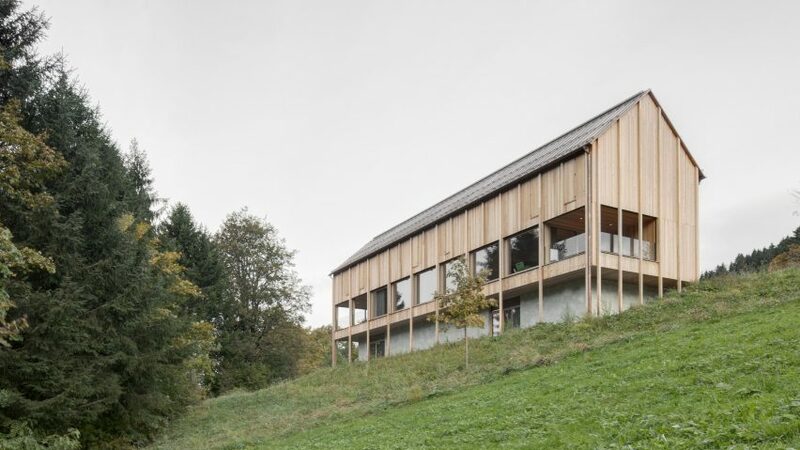 The form of Haus am Stürcherwald is characteristic of the practice's style, with similar projects including a blackened-timber house that stands on the edge of a small stream in Lochau, and a pine and spruce chalet in Fontanella.